The “Clay Stash” has been Found! By Edgefield Advertiser on February 6, 2013 Comments Off on The “Clay Stash” has been Found! 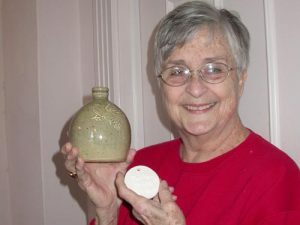 The “Clay Stash” is a game sponsored by Potter Justin Guy who works in the Old Edgefield Pottery atelier, and clues are given each week in the Advertiser. Ann said the clues that led her to it were words like “story” and “hard back.” And sure enough, behind a hard back book on Strom (former governor), standing up, she found the disc. The Advertiser presented her with the pot, which she coveted, she said, because on it is a special insignia – a bird (Byrd). Interesting that the search led folks to many areas in Edgefield, even the Rail Trail. Clues for the next search will be coming with Potter Justin Guy’s next article toward the end of February. Look for it online and in print.